Would you like to have in your repertoire some more killer mentalism effects that you can perform anytime, any place and without any props? The participant's experience of what occurs during these casual performance pieces is this: during the course of an interesting conversation, things take an odd turn and something strange and completely inexplicable happens. You will learn a fantastic impromptu prediction using any three borrowed objects, an incredible mind-game using just your fingers, the world's best linguistic bar bet, how to travel a few minutes into the future, the secret of the invisible red envelope and much more! All in all, nine brand new effects that have been designed with one outcome in mind - to amaze whoever you are talking to without the aid of any gadgets, gizmos or gimmicks. 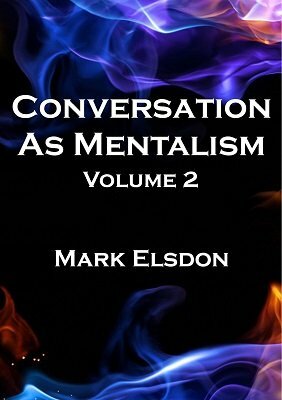 Conversation As Mentalism 2 once again teaches pure, propless mentalism at its most organic. 1st edition 2015, 35 pages.